Coal dust can be hazardous to human health and safety, but there's not much evidence that enough coal dust is escaping uncovered trains passing through Spokane to pose a clear danger. This week's cover story is about how local leaders and activists have been fighting against oil trains, warning of a fiery catastrophe that could kill dozens if a train derailed downtown. But the upcoming ballot initiative that would penalize the owners of certain types of oil train cars when they pass through Spokane would also fine the owners of uncovered coal cars, which don't explode if they derail. That has critics like county Sheriff Ozzie Knezovich — a former coal miner himself — arguing that the initiative isn't really about health and safety at all. He suggests that environmentalists are using the fears over oil train explosions as a Trojan horse for an anti-fossil-fuel agenda. But the initiative's proponents argue that uncovered coal trains are a danger to human health and safety, beyond concerns over climate change. They suggest that coal dust from trains coming through Spokane is hurting our lungs, poisoning our water and increasing the chance of derailments. Yet so far, the evidence that coal dust from trains is putting the health of Spokane residents at risk is thin, to say the least. Let's start with a few undisputed facts. As anyone who's seen Zoolander knows, breathing in enough coal dust can be bad for your health. It can seriously damage your lungs, giving you "Coal Worker's Pneumoconiosis," scarring the lung's connective tissue. It can also cause bronchitis and emphysema. And coal, in high enough quantities, has the potential to contaminate rivers with mercury, arsenic and other toxic materials. Finally, BNSF Railway itself has presented extensive evidence that too much coal dust buildup on the tracks can lead to derailments. According to the New York Times, "after an extensive study, [BNSF] determined a dust buildup can prevent water from draining from track beds, which in turn can push steel rails out of gauge and cause derailments." "BNSF has been at the forefront of coal dust research because we were the ones who first raised coal dust as an issue in the Powder River Basin in Montana and Wyoming more than a decade ago," BNSF spokeswoman Courtney Wallace says in a statement. "BNSF has a vested interest to ensure shippers are in compliance with our coal-loading rule, as coal dust poses a serious threat to the stability of our tracks." But as anyone who has taken a middle-school science class knows, it's the dose that makes the poison. Even broccoli has a tiny amount of cyanide in it, but we don't consume nearly enough to make it dangerous. The question isn't whether coal dust can ever be dangerous. The question is whether the coal dust from coal trains traveling through Spokane County is dangerous enough to justify the initiative. Lisa Woodard, public information officer for the Spokane Clean Air Agency, says that the agency is not concerned about the coal dust from coal trains. "We have been asked this over the years, when different [coal] terminals have been proposed," Woodard says. "The real dust concern is in the loading and unloading, and the first few miles from the loading and unloading. Our concern was not excessive coal dust." Woodard says the far bigger issue is diesel exhaust from the coal trains. In other words, the locomotives, not the cargo, are the subject of clean air concerns. Covering the trains wouldn't do anything to address the diesel exhaust. The railroads make an even bolder claim: Coal dust isn't blowing off trains coming through Spokane at any significant levels. BNSF requires coal trains be loaded in a "bread loaf" style and to be sprayed with a surfactant to dramatically reduce the amount of dust that can escape from trains. Most of the remaining dust that escapes does so within close proximity to the mine or loading terminal — far away from Spokane. "There is no basis whatsoever to conclude that any significant amount of coal dust is lost from trains operating in the Pacific Northwest," BNSF's Wallace says. "In fact, early testing results recently undertaken indicate there is not significant coal dust measured in Washington. As we’ve stated all along, coal dust is only an issue near mines in the Powder River Basin — not elsewhere along our rail line, and certainly not in the Pacific Northwest." Jaffe acknowledges that the level of coal dust currently being emitted from trains "doesn’t exceed the federal standards for particulate matter," though he emphasizes that's with the current volume of coal trains. He warns that an increase in train volume could raise the risk level. It's important to note that the conditions in the Columbia River Gorge are different than in Spokane. Trains are traveling faster, and the wind is blowing harder. “In the urban areas where the trains are going slow, the diesel exhaust is probably a bigger issue,” Jaffe says. The state Department of Ecology assessed the coal dust question extensively in its Environmental Impact Statement for the proposed Millennium Bulk coal terminal in Longview, Washington, which could send 10 times as much coal traffic through the state if approved. It did find unavoidable cancer risks associated with diesel exhaust near Longview and in Cowlitz County. But ultimately, it concluded that while coal dust was more likely to be a nuisance along the windy Columbia River Gorge than the rest of the state, the impacts of coal dust from "rail transport of coal would not be significant because emissions would be below applicable federal standards." The Surface Transportation Board's analysis of a proposed rail line in southeast Montana came to the same conclusion. The board ultimately rejected the proposal, not because of environmental concerns, but because some of the coal mines the railroad would serve were shutting down. While coal dust impacts in coal mines have been widely studied, the health impacts of nonoccupational exposure to coal dust, such as coal dust from rail cars, have not been extensively studied. Some studies have found that communities near large coal-handling and processing facilities could have higher rates of respiratory complaints. Others have found no difference between these communities and those farther away from coal facilities." So far, at least, the bulk of evidence suggests that while some coal dust does escape from even the coal trains sprayed with a surfactant, it's not enough to be a danger to human health. Obviously, burning coal has a number of environmental impacts, from air pollution to acid rain to carbon emissions to the risk of serious river contamination from leftover coal ash. But the question here is the health impact of the trains themselves. This March, environmental groups — including the Spokane Riverkeeper — walked away with a kind of victory. 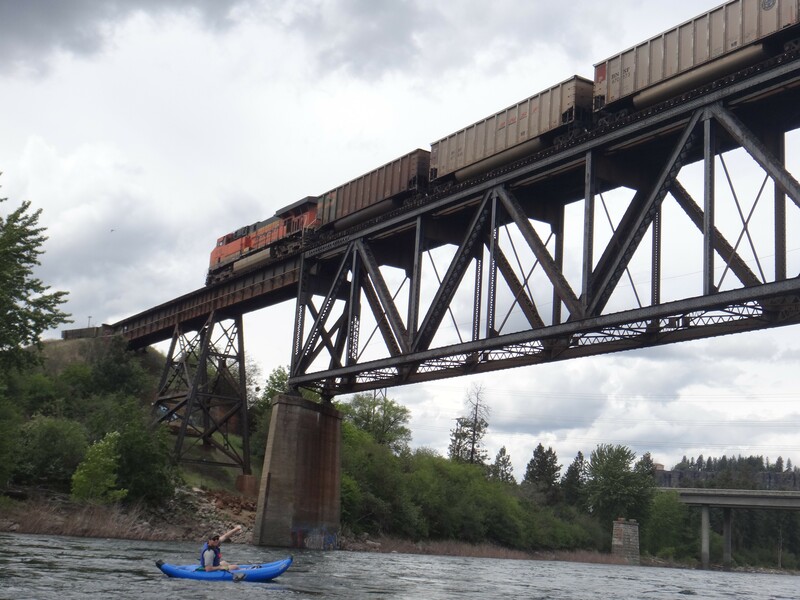 Not only did the environmental groups get a $1 million settlement in their case accusing BNSF of dropping coal into water along the rails, violating the Clean Water Act, but as part of the deal, BNSF will embark on a two-year study into the feasibility of covering coal trains. Yet the judge in that case noted that the question was whether pollutants were being introduced to the water at all, "not whether the plaintiff can show there has been actual environmental harm. ... Proof of actual environmental harm is not necessary." The settlement means that that the question of whether coal trains are harming the river itself remains an open one. White says he can show examples of pieces of coal coming off trains and landing in or near the Spokane River. He also says he's spoken to tenants in apartments near the railroad tracks about dust that gets on their balconies. But he also says it's clear that the issues in Spokane are not remotely as bad as they have been in the Columbia River Basin, where BNSF agreed to conduct cleanup efforts. Even in the Columbia River Basin, however, there's a difference between "nuisance" dust and unhealthy environmental damage. When the DOE examined the impact of the Millennium Bulk coal terminal, it concluded that "there would be no unavoidable and significant adverse environmental impacts from coal dust." "The study found that none of the chemical concentrations estimated for soil would result in values greater than the EPA ecological soil screening levels for plants, soil invertebrates, avian wildlife, or mammalian wildlife." "Coal dust is not anticipated to have a significant impact on water quality." "Coal dust particles would likely be transported downriver by river flow and either carried out to sea or distributed over a sufficiently broad area that a measurable increase in concentrations of toxic chemicals in the Columbia River would be unlikely." To be clear, activist groups have objected to the state's analysis, arguing that it is underestimating the amount of coal dust emitted and the health and environmental risks associated with it. Sightline Institute, an environmental think tank in Seattle, argues that the DOE made serious mistakes with their analysis of the impact of coal dust at the Millennium Bulk loading terminal. "If that is the case with the coal loading with the terminal itself, it would not surprise me that there are similar methodological problems with the [measurements of coal dust from trains]," says Sightline policy director Eric de Place. But de Place says there's frustratingly little research on this issue, and that he's not aware of coal dust having created any environmental damage in Pacific Northwest rivers. "It’s surprisingly understudied. You can document some kinds of harms for some kinds of ecosystems. Is there proof in the Northwest? I don’t think so," de Place says. "People have been shipping coal since the time of the Romans. It’s weird to me [that] there is so little research." The derailment risk is how Councilmember Breean Beggs, the author of the oil and coal train initiative, justifies punishing uncovered coal trains. Since coal dust, in enough quantities, has been shown to cause derailments, and an oil train derailment poses a serious safety risk, Beggs argues, it makes sense to be worried about coal trains if you're worried about oil trains. The federal government has ruled that this is an issue. In 2011, the Surface Transportation Board, part of the U.S. Department of Transportation, concluded that coal dust can create serious problems with the material in railway track beds. The coal dust, when combined with heavy rains, causes serious problems with the track bed's ability to drain water. "Where large portions of ballast are fouled, the track then can become susceptible to movement when a train travels over the tracks," the board concluded. The study concluded higher levels of coal train traffic would result in more frequent impacts than lower traffic levels. Impacts at locations near the tracks would be greater than at locations farther away. Impacts from trains carrying coal with a shaped load profile and to which a topper agent has been applied would be less than impacts from trains carrying untreated coal. The Millennium analysis, however, doesn't explore whether coal-dust derailments are an active concern for the Millennium terminal project in Spokane, or anywhere else in the state. BNSF argues that the levels of coal dust escaping in Spokane, if any, is minor enough that this isn't a concern. "Since 2005, BNSF has been collecting data on coal dust deposition along the rail lines in the Powder River Basin, and our studies show that coal particles that can be blown out of loaded cars in transit are likely to escape the train in close geographical proximity to the mines and diminishes substantially afterward," Wallace writes in an email. Unfortunately, while there have been assessments over whether the coal dust emitted by trains in Spokane causes a risk to the environment or human health, there's precious little information about whether the coal dust buildup is enough to make a derailment a greater danger. But so far, de Place says, there's no evidence that it's been a problem in Washington state.